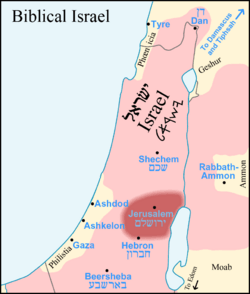 A map of the Kingdom of Israel, as described in the Bible. 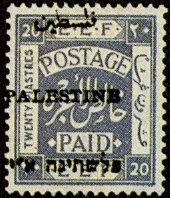 The Land of Israel (Hebrew: אֶרֶץ יִשְׂרָאֵל ʼÉreṣ Yiśrāʼēl, Eretz Yisrael; Arabic: أرض إسرائيل) is a name for the region also known as Canaan, Palestine or the Holy Land. The name comes from the Torah and the Bible. The area is located in the Middle East, and covers the southern part of the Levant. Before the rise of the Kingdom of Israel, the region was called the Land of Canaan (the home of the Canaanites). In the Bible, the land was referred to as the "Promised Land" or the "Holy Land". Map of Eretz Israel in 1695 Amsterdam Haggada by Abraham Bar-Jacob. Land of Israel Facts for Kids. Kiddle Encyclopedia.